Adrian Martinez outside his home in Kennett Square. Having spent most of the past four years immersed in the 18th-century world of botanist Humphry Marshall, Adrian Martinez feels like he knows the man, inside and out. That depth of knowledge will be on display when the Chester County Historical Society opens “The Visionary World of Humphry Marshall 1750-1800” on Nov. 5, for an extended run that lasts through December 2017. The 12 paintings that Martinez completed for the exhibition distill all of his research and all of his deeply held feelings about Marshall, a forward-thinking Quaker businessman whose boundless curiosity about the world is reflected in documents and objects held at the Historical Society. Martinez has also teased out the motivations and personalities behind the letters and business ledgers to get a true picture of Marshall's inquisitive mind. 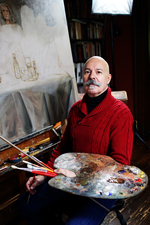 “Art communicates a world,” Martinez said during an interview at his rambling 1894 home in Downingtown. “It's the same vitality I felt when I was a kid of 7 or 8, walking through the Smithsonian Institute or the National Gallery, looking at the furniture and the paintings and the sculpture. I was convinced, although I didn't know how, that life was meaningful. Profoundly meaningful. “In the show, the microscope that Humphry Marshall is looking at in my painting belongs to the museum. 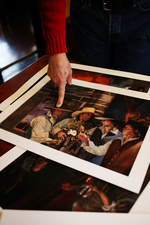 It's going to be right in front of the painting,” Martinez said. “The chair that Marshall owned will be right next to the painting. A lot of people will see a chair in a museum and it's just a piece of wood from a certain time and place. With me, it's a beautiful shape, and I can't help thinking of the people who sat in it, and cried in it, or laughed in it, or were deep in philosophical, scientific conversation. Martinez has always focused his artwork on well-researched aspects of history, and in 2005, he put together “Where Two Worlds Meet,” a show of paintings of early Quakers and Native Americans. But the Humphry Marshall project has required an unprecedented effort from the artist. “Being someone who's not just an artist, but who is getting the project done – that's what I didn't have experience with,” he said. “Being a politician, executive, fundraiser – it was all new to me, but I had lots of help. I had to do the best I could. The research I loved, the paintings I loved, but not being everything to everybody. At the base of the challenges Martinez faced is the fact that no image exists of what Humphry Marshall looked like. As a Quaker, he likely felt that portraits were needless vanity, so Martinez had to find a model to stand in for Marshall. He found that model in renowned horticulturist David Culp, and he enlisted other friends and associates to portray the other people in Marshall's life. Marshall was born in West Bradford Township in 1722, the first cousin of American botanist John Bartram. Marshall was a farmer and stone mason, but was a self-described “curious gentleman” who cultivated, collected and sold plants from his extensive garden and greenhouse at his Marshallton home. His botanical garden there was the second in the United States, following the one John Bartram established in Philadelphia. Marshall was a member of early scientific societies, and a member of the American Philosophical Society. He was a correspondent of Benjamin Franklin, who sent Marshall a telescope to help him further his studies. Marshall also helped care for “Indian” Hannah Freeman, a Native American woman who was a link between the native Lenape and early settlers. She may have worked for Marshall, and occasionally lived in a cabin on Marshall's property. Marshall's study of plants – both the newly discovered American varieties and specialty plants sent from Europe – led to him writing the 1785 book, “Arbustum Americanum: The American Grove, An Alphabetical Catalogue of Forest Trees and Shrubs, Natives of the American United States.” The book used the Linnaean system of Latin names for plants, making it difficult for many readers at the time to grasp. There were also no illustrations in the book, limiting its appeal to a broad audience beyond scientists and botanists. But the book was a landmark, and Marshall got many things right. The names he came up with for many plants and trees, including the sugar maple, were not changed by successive generations of research, Martinez said. While Marshall's extensive garden in Marshallton is gone, there are yellow aconite flowers that still bloom on the grounds – descendants of the ones Marshall planted himself. His stone house still stands, and the property has a historical marker. “We do have lists of what he sold,” Martinez said, describing the long ledgers of plant names and sale prices that are in the Historical Society collection. The list shows what a rich and diverse collection of plants Marshall cultivated. While many of Marshall's papers were burned as trash by later descendants, the Historical Society does have some of his business ledgers, and there are copies of letters from Ben Franklin to Marshall that discuss the ongoing scientific research being done by both men. Martinez was struck by how complicated a man Marshall was. As a Quaker, he was not supposed to pay taxes during the war, and was told to stay neutral. “Then you get it from all sides,” Martinez said, smiling. “He took his faith seriously. He built roads, he built bridges, he took care of Indian Hannah later in her life.” Part of Marshall's interest in “Indian” Hannah may have been her extensive knowledge of the healing properties of native plants, Martinez said. Humphry’s first biographer, William Darlington, said of Marshall, “He saw 50 years ahead of his time.” In one of his letters to Joseph Banks, the president of the Royal Society in England, Marshall suggested an exploration of the then-unknown western part of North America, 20 years before Lewis and Clark started their journey. Martinez's paintings “are teasing out meaning from the past,” he said. “It's all about nuance. It brings that world alive. I can talk to these people when I paint them. Like a loony, I start talking to them. And they talk back,” he said, laughing. “Adrian Martinez Presents the Visionary World of Humphry Marshall” opens at the Chester County Historical Society (225 N. High St., West Chester) on Nov. 5. For more information, call 610-692-4800 or visit www.chestercohistorical.org.